Next morning we caught a local flight to Nanjing and transferred to the 4* New Century hotel. Nanjing was the old capital of China during part of the Ming dynasty (1368-1644) & for a second time, briefly, in the early 20th century. After lunch we visited 3 famous sites - Yangtze River Bridge, Dr. Sun Yat Sen’s mausoleum & the Nanjing Museum. Next morning we walked to the central railway station near our hotel and boarded the train to Suzhou. 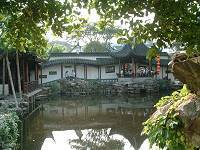 Suzhou is famous for its classical gardens. 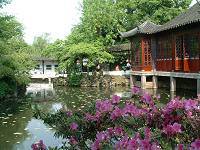 I have been told about the beautiful gardens of Suzhou since I was a child and so I was looking forward to this trip. The two hour train journey was very pleasant in a very comfortable soft seat compartment. Our guide met us on the arrival platform & transferred us to the 4* Aster hotel, then to lunch. After lunch we started our tour of the famous Suzhou gardens, first going to The Humble Administrator’s Garden. 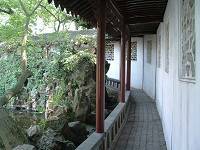 The gardens of Suzhou are not just gardens alone: in classical Chinese architecture, the buildings of the house are so closely integrated with the gardens that the garden becomes part of the house, and the house becomes part of the garden. In fact the large houses of wealthy people are made up of many different buildings and pavilions spread throughout the garden. 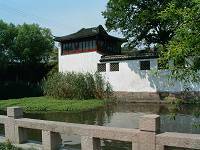 The Humble Administrators Garden is the largest garden in Suzhou, featuring streams, ponds, bridges, walkways, islands, courtyards, pavilions & classical Chinese buildings etc. The design & beauty of the garden reminded me of a classic Chinese painting. Even with a large number of visitors walking around the calm & tranquillity of the landscape is overwhelming. Local people come here to enjoy themselves too, such as a young couple sitting lovingly under the willow tree while a young man was reading his book on the rocks by the pond. I would also like to have stayed longer to admire the beauty of this garden. Our next visit was to the Garden of The Master of The Nets. In contrast, this is the smallest garden but is a very favourite of mine. This is a garden with living quarters comprising east wing & westn wing along with many separate courtyards one after another, with the central section being the main garden. It is like a private secret garden and courtyard in each quarter. It is a joy to walk through each courtyard with lovely individual designs of rocks, plants & trees. The most delightful feature of all is the little private courtyard between the rooms or buildings. From the open shutters of the wooden doors of each room the glimpse of the small courtyard outside is very pleasurable. Finally that afternoon we visited The Lingering Garden. 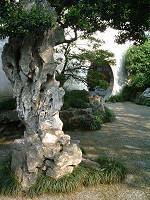 This is another stunning garden with the most memorable structures of beautiful classic Chinese walkways along the rocks & ponds of the garden. It is so beautiful that it eases one’s mind by looking at this masterful piece of art. These gardens still linger in my head weeks after I return to UK. Next morning we returned to visit another 3 gardens. First was the Couple’s Garden. This is another favourite garden of mine. It has similar courtyards & buildings like to the Garden of The Master of The Nets but with bigger gardens & ponds. The entrance to this garden is the very best. The building is encircled by a moat. It looks more like a little castle with tall white walls with pavilions at the corners. We walked along the canalside which local wooden boat use to ferry their daily stock. At the corner of the pavilion there is a bridge to walk over onto a quiet cobbled path that leads to the entrance of the Couple's Garden. The main door faces the moat and a tall protective wall from the outside. It has the most privacy & a lovely surrounding environment. The Blue Wave Pavilion also has lovely & peaceful gardens with walkways, pavilions, courtyards & ponds. Finally we visited the The Coiled Gate Park, a public park having only the remaining original Suzhou city water gate, and a section of the old city wall. 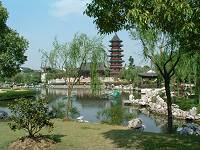 It is a very pleasant park with ponds, moats, bridges, pagodas, temples & lovely parkland. Before we drove to Zhouzhuang we inspected 3 hotels: the 4* Garden View & Bamboo Grove plus the wonderful 5* Sheraton hotel. We are using these hotels for our tours in Suzhou. It took about one hour to drive from Suzhou to the water city of Zhouzhuang.